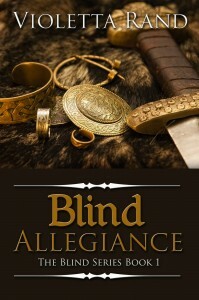 Blind Allegiance is a historical novel set in an era I’m not very familiar with– the time of the Vikings. The romance is between Randvior Sigurdsson, a Viking chief and worshiper of Odin, and the devoutly Christian Britain, Noelle. Bartered to him by her brother as payment for leaving the family home intact, Noelle is repulsed, while at the same time, intrigued and attracted to Randivior. The storyline, especially after the couple is on the ship heading back to Norway, moves smoothly. The beginning of the book was a little confusing as we are set right down in the middle of the action and it took me a little while to know what was going on. The book also read more like a more modern historical romance instead of being set as far back in time as it was. While the story was interesting and I really liked the characters, I never had the feeling that I was actually in the 11th century. However, the characters more than made up for that–Randivior is a man of honor who, having seen Noelle in a vision sent from Father Odin, is sure she’s his fate. So, he sets about to make that happen. The interaction between him and Noelle as they move from enemies to being physically lovers and then to falling in love is interesting. Noelle is seduced into a physical relationship, but still keeps a part of herself back–and that’s the part Randivior wants to claim. Unfortunately, his mother doesn’t make it easy on them. Overall, it was refreshing to read a historical romance outside the norm. Even better, this is the first of a series, and I’m looking forward to the next books.